If you have visited the Dean Bond Rose Garden this growing season, you may have noticed a large section of the climbing and hybrid tea beds now contains marigolds, Tagetes patula cultivars, instead of roses. 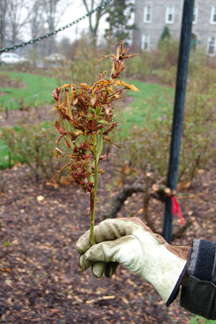 This April we removed about 17 rose shrubs because they were infected with Rose Rosette Disease (RRD). 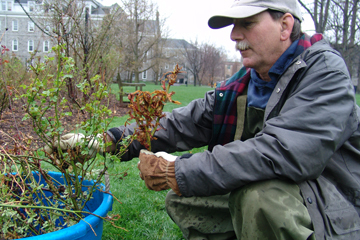 RRD was first observed by a local gardener and Scott Associate, Judy Penney, on her climbing rose in Swarthmore. The disease has since devastated her once prolific rose and symptoms have begun to appear in the Dean Bond Rose Garden. Symptoms of RRD are highly variable depending on the species and cultivar of rose. These symptoms include: rapid elongation of new shoot; witches’ brooms with small, distorted leaves; excessive growth of unusually soft and pliable red or green thorns; canes that appear thicker than parent canes; and new growth’s traditional red pigmentation never matures to a green tone. To see a complete list of symptoms read the Plant Disease Fact Sheet from Virginia Cooperative Extension. In the Rose Garden, we have observed witches’ brooms with small, distorted leaves and conspicuous red pigmentation as well as rapid elongation of shoots with excessive thorniness. RRD is believed to be caused by a virus originally introduced to control the invasive Rosa multiflora. While this virus is effective at overwhelming R. multiflora, cultivated roses are also highly susceptible to it. The disease is transmitted by a microscopic wingless mite, Phyllocoptes fructiphylus, or by grafting. These mites are known to travel on wind currents from infected to healthy plants. At this time there is no effective control available for infected plants. It is recommended to remove all infected plants to prevent transmission to healthy specimens. The pathogen can survive on old root pieces in the soil, thus be sure to thoroughly remove all parts of the infected plants. Where permitted, burning can be used as removal technique. Once uprooted be sure to remove infected plants from the vicinity of remaining healthy roses. At this time no resistant species or cultivars have been identified. Because there is no direct treatment for the virus, we are attempting to control the carrier of the disease, the microscopic wingless mite. We are applying a miticide, Avid, along with other treatments on the garden. 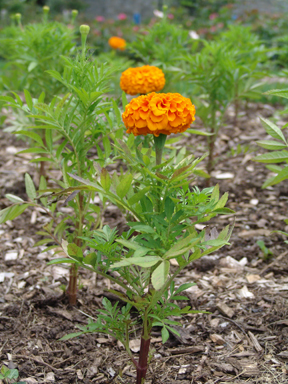 Historically, marigolds have been used in vegetable gardens to help mitigate the effects of many problematic pests. In England, marigolds have also been planted in rose beds where roses have been removed to help reduce the effects of Rose Replant Disease, which is another problem in the Dean Bond Rose Garden. It is our hope that the marigolds will ward off the mites. Thus we have planted Tagetes ‘First Lady’, ‘Inca Orange’, and ‘Sweet Cream’ in an attempt control RRD. Other efforts include sterilizing pruners between pruning and deadheading as well as monitoring and removing any newly infected plants. This fall the marigolds will be removed and the bed will be replanted with roses. 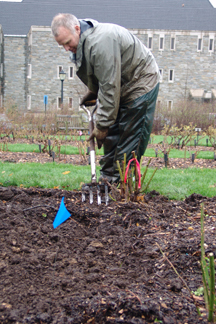 Check back with GardenSeeds to see which species and cultivars we will reintroduce to this location of the Rose Garden. I’m glad the blog is up and running again. Thanks for the rose info! Thank you, Barb. We have fixed some of the access problems. We are working on some the problem with calendar and lower menu bar. We hope to have it back to 100% soon. I was happy to find this after diagnosing a client’s RRD. Please post the cultivars you chose to replant with and their progress. RRD has quickly killed a 15yr.old White Dawn climber and my devastated client would like to replant if possible. I will post as soon as our collection committee decides which roses to try. We have another member of the Scott Arboretum who is also losing a beautiful old climbing rose. Some say spraying an anti-transpirant such as wilt-pruf on the roses every few weeks during the summer might help. The anti-transpirant creates a barrier between the mite and the leaf where it lands, preventing the mite from realizing it has reached a food source. Instead of settling in on the rose, the mite would supposedly hoist sails and drift away to a different plant. thank you for this site. unfortunately it did show me what was wrong with my hybrid roses. rose rosette is alive in west tenn.
Just yesterday I discovered the facts of this disease, long after it has taken over my extensive front yard rose beds. 18 Nearly Wild Rosas lined by sidewalk in spectacular fashion for the last seven years, supplemented by three Knockouts and two unknown Grandifloras – all now infected with two dead already. I’m in shock, if not depression, here in the DFW area, west side. After my visit to RoseGeek.com I too have come to grips that my 7 knockout roses just planted in April 2011 have Rose Rosette. My husband and I were amazed at their rapid growth (4ft in 2-3 weeks!) and after I cut them back within a month they were 4 ft tall again. Had no Idea they were in trouble until the new leaves and buds appeared deformed and unattractive. Now I know I had no green thumb, I had an effected rosebed growing rapidly from the disease. I am terrible with blackspot on roses here in humid Metairie, Louisiana so I thought I’d try the knockout “DISEASE RESISTANT!!!!!! !” roses. So sad, I’m going to miss them. RRD is alive and well in central Kentucky. It started with my David Austins and moved right along to my hedge of knockouts. Such a pity. The knockouts had been so good for my self-esteem. Any word on the replanting process? I am in Oklahoma City and the disease is rampant here as well – have pulled five bushes so far that are scattered around my garden, afraid to see more affected soon. I may have to move if I can’t replant eventually. No roses would be an unhappy state! We continue to have problems with RRD at the Scott Arboretum. We are trialing new floribundas to see if they show any resistance. I am in the DFW area in Texas and I know realize all of my rose bushes have been infected with RRD. 🙁 Can it spread to other types of bushes? I am wondering what I will do in my flower beds. I have to replace it with something bc I a, listing my house. This is just so sad! I have 2 rose trees that looks to be infected. One tree showed signs of wierd growth and compacted branches. It has recently transmitted itself to the rose tree to the rtight of it. Is there any way to just remove the diseased growth in hopes that the tree will survive or is there no hope for it? I live in Lebanon, TN and hope to prevent it from spreading to my other bushes. The RRD can spread to almost any roses. We have seen it infecting a wide variety of rose types. I noticed the rapid unattractive growth on my Knock Out Roses in our very warm late winter, early spring months. Then sudden browning and wilting of the leaves, save for one cane in some of the plants, which have later bloomed. To complicate my investigation, we have had a frost, and a lawncare company has sprayed our lawn and shrubs twice during this time. The roses are not the only shrubs that are showing this leaf wilt, and stress: a flowering pear, weigelia, and Nine Bark shrubs also have severe symptoms, but are still living.I am the only garden in the neighborhood with these issues at present ( an the only one sprayed,as well). I have read that mild exposure to some herbicide (Round-Up) can cause symptoms similar RRD. Is this true? Can the mites that cause the RRD also do damage to other shrubs? The mites that spread RRD only effect roses, so I doubt the symptoms you are seeing are due to RRD. Roundup drift could be a reasonable assumption too. However, frost damage could also be the cause. This has been a very strange growing season thus far. A late frost after some plants leaf out could cause leaf damage that might result in leaf wilt. You are saying that it is more than just your roses that seem to have a problem, this would seem to indicate it might not be RRD. Ask your lawn service what they have sprayed on your lawn and shrubs. Broadleaf herbicides can cause distorted growth on plants if they are affected by spray drift on a windy day. On a really warm day some herbicides can volatilize and cause damage. I would take a sample of the plants to your nearest cooperative extension office to try to confirm the cause of the problem. Rose Rosette disease found in a garden in Elkins Park, Pa.
All six rose bushes have it. One rose bush over 30 years old. One of our Master Gardener projects is a community beautification garden in Williamstown, West Virginia. We have a bed of 20 knoclout roses. Last year we noticed the abnormal growth in one of the plants, but were not able to diagnose it as a problem. This year it has spread and now 5 of our plants need removed. We are hoping we don’t lose the entire bed!! I just spent my morning digging up 7 roses infected with RRD, which I hadn’t even heard of until I started looking for the cause of abnormal growths on a few plants. I had 21 roses before today (some 30-40 years old), and I’m hoping that the rest will be spared. This has been a devastating experience. If you know someone who grows roses in the Louisville, Kentucky area, please let them know this disease is present our area. — I’ve been growing roses in Charlotte for 25 years and have never seen (or heard of) RRD before last year. From these posts, it seems its all over the Southeast. What’s happening? — I noticed that many people posting here found RRD on Knockout roses; could they be the source? — What do I spray the cleaned out rose bed soil with to kill the RRD virus? — For the past 2 years both my Clematis have had Clematis Wilt. I wonder if it’s related to the RRD? Thanks for all the information on your site. I have had problems with this disease for the last 3 years; unfortunately, despite solid research attempts, I didn’t know until yesterday. I live in Central Kentucky. I don’t live near any Rosa multiflora. I noticed the disease first on a Pink Grootendoest Rugosa that I purchased @ Walmart. The next victim was teasing Georgia followed by Ombré Parfaite and Climbing Devonensis. I cut Teasing Georgia to the ground last fall just to see if it would recover; it did well in the Spring, but the disease is in full force now. Most of the roses in my garden do not appear infected. I planted 10 old roses from Pickering in the spring, but they are on the other side of the yard; Pickering no longer sells any of those roses. I have submitted another order to Pickering, but I may cancel it. My entire garden plan is built around old garden roses. I don’t know how to proceed at this point. Thank you for the information. We have just discovered today that one of two of our David Austin climbers that we planted this past spring has RRD. Greenville SC area. Sending out Email links to all out friends. Does RRD also cause yellowing of leaves with black spots? I am all too familiar with blackspot and the spots on my bushes definitely do not look like that. Have had one floribunda that was classic for RRD, 12 more in the bed have the abnormally yellowing leaves but no clear symptoms of RRD. I believe that two of my bushes have RRD. They have all the described symptoms including an unbelievable amount of thorns as well as the disfigured leaves and witche’s brooms. I’m very sad to have to dig up my roses. I’m about 40 miles NW of Philadelphia. RRD, from what we have seen does not cause yellowing or spots. This sounds like black spot. The foliage will be an exaggerated reddish green of new growth with contorted stems and leaves. I have heard through the grapevine that Conard- Pyle has agreed that RRD is a major problem of Knockout roses. They have committed to spend 2 million dollars in funding to work with several major chemical companies to study the eriophyid mite which is the vector of the disease. Thanks for the information. I had been puzzling over what to do with (1) of my floribunda roses with these unusual symptoms, now, sadly, in preparing the garden of 24 roses for a Michigan winter I am afraid that I may have spread RRD to some of the others by careless pruning. I realized in the summer of 2011 that my knockout roses had a problem. And then found out about RRD. We then had to on every rose in our yard. We had to dig up all 16 of our roses. And I was told to get out every single root. Then I poured a gal. of chlorox in the hole in hopes of killing anything left in there. I then took the diseased roses about a mile from our home. We live in the country so could dispose of them away from others properties. I just purchased my first replacement rose, the Chrysler Imperial. And will not plant it in same area where other roses have been. We had a Bishop’s Castle which was our favorite rose, and had dug a bed by front porch JUST for that rose. And of course we had to remove it. I have ordered another Bishop’s Castle and would love to plant it in that bed. But now am wondering if I should do that as hate to lose this new rose. What does anyone think about that? Any info is appreciated. We tried to get all it roots but was hard to do, we dug it up last summer (2012). By the way we live 30 miles south of Norman, Ok. I just dug up and destroyed my favorite climber–a Pinata–after realizing that it had RRD. I am going to plant cannas or lilies in that spot, but think I will also plant marigolds in many of my beds around my other roses. What a devastating loss of a plant that bloomed so faithfully from spring until Thanksgiving for about 5 years! I live in Wichita, KS and of course we’ve had excessive heat and drought for the last 2-3 summers. I have just moved into a home with over 60 rose bushes. I certainly hope that my roses don’ t get hit with red. However, I do have a question about what appears to be an invasion of a somewhat casual/ wild looking roses into the same space where my many hybrid tea roses are. Will these lesser roses strangle out the mor formal teas? And what should I do to stop them? I would put infected material in the regular trash and not in green material to be composted. My beautiful beds of sunrise/sunset shrub roses have been affected with RRD. They bloomed for 8 years spectacularly. I removed one that didn’t survive the winter, but I was hoping there was some cure for the rest. I went to several nurseries in my area and no one could identify this disease. Sadly, I found your website, in search of finding a cure. Now I will have to remove the remaining roses in the beds and another bed of carpet roses that also have signs of it. How do I prepare the soil once the roses are removed, for any new plantings? I appreciate any advice. We live in southeast Michigan. We put in a couple of flower beds consisting of about 40 bush roses at the end of 2010. I cannot remember the type but they are not Knockouts and have a lovely well formed deep red flower. This year we have seen RRD infect over 60% of the plants. So far we have not seen evidence of it on our old but beautiful climbers but we are expecting them to get infected to (according to the blogs). I would say this is going to devastate the rose population in the USA. Does anyone know of a spray that will kill the mites that cause the disease that can be used in the garden and will do no harm to wildlife? Also are any universities or rose sellers investigating the disease since the economic impact to the business will be huge if they dont come up with a solution? To my knowledge there is nothing widely known that will stop the spread of RRD. Yes, the industry is fully aware of this problem and is doing significant research. My Mcartney roses have been planted for years . They started showing the disease a year ago so far we have pulled out 2 bushes . I suspect the rest of these old grand dames are infected but have yet to show signs of the disease. I’m up in Bucks County Pa and these roses where the pride of my garden. I hope a cure can be found soon . I only have 3 rose plants. My 2 knockouts had this disease for several years and I just though it was a weird mutation. I have now removed the roses and won’t be planting knockout or any other roses in the area. I was hoping to save my climbing Zephirine. No luck, it is now infected as well. I will have to remove. I will try to remove all bits of roots and plant another. I only had the vine 3 years, but this was the first year it bloomed. I was so excited to see the blooms on my shady side of the house. I didn’t notice the disease until a month ago, but it is really taking over fast. Very frustrating, but I really feel for the owners of really old special roses. Very heart breaking. I know several other friends in my area that have the same problem with their knockouts. This is really a serious problem, I hope someone can find a solution soon. I live just north of Nashville. I had a beautiful double knockout rose bush that has been envy of neighbors. I started cutting it back on Sunday because it had grown so much. I don’t know how long it has had RRD but it has looked strange for a while. I thought it might be a fungus until I started reading. I live in western NC in the foothills. ???? You should remove your plant and destroy it to prevent the RRD spreading to other plants. Today I noticed what I suspect to be RRD on one of my double knockout roses I had planted last spring. I plan on digging up & destroying the plant tomorrow. Is there anything I can do to protect the remaining rose bushes? 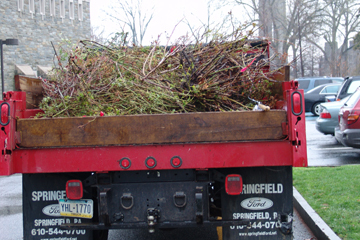 The best thing you can do to protect your remaining rose bushes is to remove the infected plant and any leaves or debris on the ground adjacent to your healthy roses. Still looking for Judy Penney to discuss more on this subject. I wiped out her email address when I got a new computer evidently, but would love to be in touch. So would a journalist who is writing an article for a local Princeton Paper. After reading this post I realize that my friend of the last 6 years is infected with RRD. I live just north of Nashville and this appeared for the first time recently. (couple of months ago). Sure did spread quickly. Taking it out tomorrow. Sorry to hear of the lose of your rose, hopefully you caught it before it spread to any others you have in the garden. The causal agent of rose rosette disease is not soil- borne, so it is possible to successfully plant healthy roses in beds where diseased plants have been removed. However, because the pathogen is systemic in infected plants, the virus may persist in RRD-infected root pieces that remain in the soil. As a result as long as the entire root system has been removed immediate replanting of a virus free rose should not result in infection. There is also no evidence that infection can occur if the root system of an uninfected plant comes into contact with an infected plant.